Giotto’s painting Madonna di San Giorgio alla Costa hasn’t been on public display in 25 years, until now, as it has moved to the Opera del Duomo Museum in the Duomo Cathedral complex in Florence. 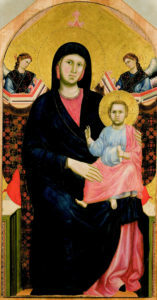 The tempera and gold painting depicts the Madonna as a queen, holding the Christ Child, with two angels and is considered one of the most representative paintings of the Renaissance. It is on loan to the Opera del Duomo Museum from the Santo Stefano al Ponte Diocesan Museum, which closed for three years after the 1993 bombing. Giotto painted the piece around 1295, and it was thought to be lost until it was rediscovered in the 1930s. In 1705, the Church of San Giorgio alla Costa cut all four sides so it would fit in an arched Baroque frame during the church’s renovation, and it hung there until it was moved to the Santo Stefano al Ponte Diocesan Museum in the early 20th century. It was damaged in the Via dei Georgofili bombing by the mafia in 1993, which tore the left-hand angel’s clothing; the lesion from the tear, caused by a splinter of wood, is still visible even though the painting was restored after the attack.